Color Me Mine, Carmel has a partnership with Big Brothers Big Sisters of Central Indiana. Color Me Mine brings out the artist in everyone. 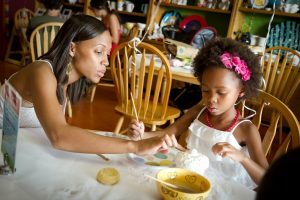 We provide a creative, relaxing space for spending time with family & friends. Art is a true therapy that is not only fun but will create memories to last a life time. 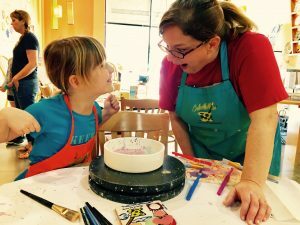 Big Brothers and Big Sisters members receive free studio time at Color Me Mine, Carmel (up to a $20 value) For more than 100 years, Big Brothers Big Sisters has operated under the belief that inherent in every child is the ability to succeed and thrive in life. As the nation’s largest donor and volunteer supported mentoring network, Big Brothers Big Sisters makes meaningful, monitored matches between adult volunteers (“Bigs”) and children (“Littles”), ages 8 through 18, in communities across the country. We develop positive relationships that have a direct and lasting effect on the lives of young people. The Big Brothers Big Sisters mission is to provide children facing adversity with strong and enduring, professionally supported 1-to-1 relationships that change their lives for the better, forever. The Big Brothers Big Sisters vision is that all children achieve success in life.